Google this morning announced an improved set of privacy controls for online users, as well as a dedicated website that attempts to answer people’s concerns regarding Google’s data collection practices across its online properties. Under a new Google settings page called My Account, users can now configure their privacy and security settings for a number of Google services, such as Search, Maps, YouTube and more, as well as disable Google’s ability to save web and app activity and your location history. The name “My Account” is something of a misnomer, because, Google says, users don’t actually need to have a Google Account registered with the company in order to use the new service. 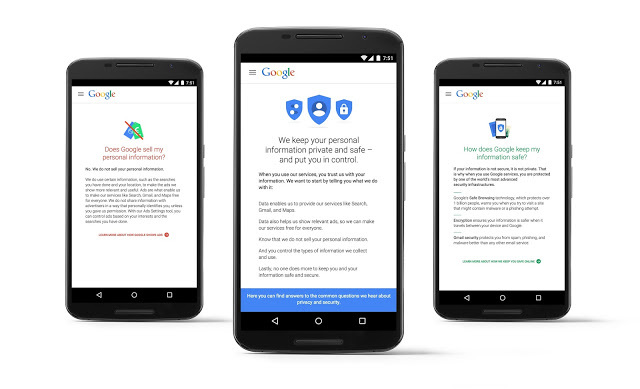 On the new site, users can run a Privacy Checkup as well as a Security Checkup, which helps walk them through making the changes they want to their account settings by checking which data they want public or private, and what data Google can use to personalize their experience. For example, users can customize what content is shown on their Google+ profile, whether or not people who have your phone number can locate you on services like Hangouts, whether your YouTube subscriptions are private, and much more. You can also customize whether Google can save certain information, which is only available to you, like your YouTube Search or Watch History, device information, voice and audio activity, location history, web browser history and other items. This is not the first time Google has attempted to put information about its services under one roof – the company first launched Google Dashboard back in 2009 to allow users to keep track of their Google activity. And in 2012, the company improved the level of detail it offered by rolling out even more granular metrics on a dedicated site. Of course, before today, users had been able to adjust their privacy and security settings on Google’s properties, but the idea with the new My Account hub is to bring all those settings under one roof to make it easier and less confusing for users who didn’t know where to look for these controls before while also offering guided walkthroughs that help them make adjustments. The changes come at a time when online users are increasingly concerned about how large Internet companies are storing and using the data they collect, following the reveal of government surveillance agendas which have involved the bulk collection of phone records and other online data. Google in particular has been of concern for a number of online users because of how extensively it reaches into users’ everyday lives; many use Google’s products for search, for entertainment, for email, for business productivity, and even to power their smartphones and other devices. The company in 2012 had consolidated its privacy policies in order to connect users across Google services, painting an even more accurate picture of who someone is online. That change drew fire from a number of data-protection agencies around the world, and has still been drawing criticism and the threat of fines several years later. The new hub appears to address some of the concerns over clarifying to users how their data is used and what they can do to make changes.